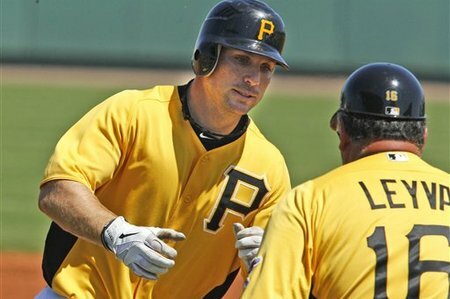 The Phillies have acquired left-handed batting outfielder John Bowker from the Pittsburgh Pirates. Details released on Wednesday state that the Phillies will send a player to be named or cash considerations to complete the deal at a later date. The 28-year-old Bowker had gone 4-for-17 (.235 avg) in 19 games this year for the Pirates. In 106 games with Triple A Indianapolis this season, Bowker batted .306 with 15 homeruns and 76 RBI. Bowker, who has played in parts of five Major League seasons, is a former 3rd round draft pick by the San Francisco Giants. Bowker's career Major League batting line (.237/.289/.390) is not an improvement over the numbers produced by current Phils lefty hitting reserve outfielder Ross Gload (.280/.325/.408). In an effort to clear a 25-man roster spot, the Phillies optioned Michael Schwimer to Triple A Lehigh Valley following Tuesday night's victory over Cincinnati. The 25-year-old Schwimer is expected to return to the big league roster at some point after the rosters expand on September 1st. Jose Contreras, out for the year with a right elbow injury, was moved to the 60-day disabled list, to make room on the 40-man roster. Bowker will wear number 16 for the Phillies and will be eligible for the post-season roster.